The wait is finally over with the exciting news that the latest edition of the official video game of the 2018 FIA Formula One World Championship, F1® 2018, has been launched across the world today. Players across the world can now purchase the game for the PlayStation®4 computer entertainment system, the Xbox One family of devices, including the Xbox One X, and Windows PC (DVD and via Steam). Developed and published by Codemasters®, F1® 2018 will be used in the forthcoming 2018 F1 Esports Pro Series Championship, where the best sim racers in the world will represent nine official F1 Esports teams across the three live events as they compete for the honour of becoming the 2018 F1 Esports Driver World Champion. They will also be fighting for their F1 team to be crowned the 2018 F1 Esports Team Champion, mirroring the accolades on the grid. Launched to critical acclaim, F1® 2018 is the most complete F1 experience ever seen in gaming. Featuring all of the official teams, cars, the drivers and circuits from the thrilling 2018 season, F1® 2018 also includes 20 iconic, classic cars from the history of the sport for players to try to master. Circuit Paul Ricard is included in the game for the first time, while the Hockenheimring, the historic home of the Formula 1 Emirates Grosser Pries von Deutschland 2018, also returns. “Our main aim with F1® 2018 was to get even closer to replicating the real world sport and we believe that we have made significant improvements both on and off the track,” said Lee Mather, Game Director, F1® 2018. “The in-game suspension and chassis now refresh at 1000htz, meaning that the simulation is far more authentic. For example, you can really feel the difference between the modern day cars, with their advanced aerodynamics and downforce, when compared to the classics, which rely more so on pure tyre grip, making them an incredibly involving drive. “The visual recreation of the sport, including the iconic heat haze, atmospherics and new lighting system, is closer than ever,” Lee reveals. 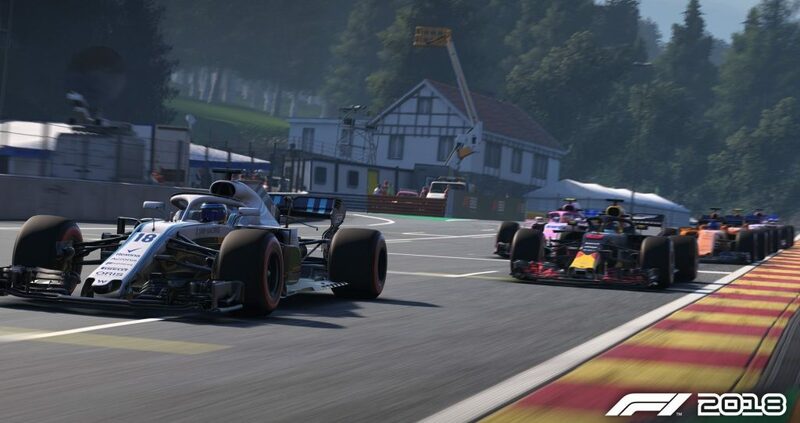 “We have added even more depth to the Career Mode by reworking the Research & Development system for each of the teams, as well as introducing the press interviews, which will play a key role in how you are seen within the world of F1. The much-heralded Career Mode is bigger and better than ever – with the inclusion of pressurised press interviews that will directly affect your standing and future within your own team and the wider sport. In research and development, each of the teams now has its own unique tech tree with inherent strengths and weaknesses as you are looking to improve your car. These improvements can then be threatened by end-of-season regulation changes, another first for the franchise.